Credit unions will have to “get innovative” now that a new regulation on debit swipe fees is finalized, one credit union executive says. The Federal Reserve Board finalized the Durbin Amendment on June 29, giving credit unions much-awaited clarity on exactly how the new law will impact them. With final wording on the law, credit union executives say they can better analyze how their debit interchange will be affected and begin developing ways to make up for lost revenue. The Durbin Amendment, part of the Dodd-Frank Wall Street Reform and Consumer Protection Act, caps debit swipe fees at a base of 21 cents per transaction and includes a one-cent fee for fraud prevention and a 0.05 percentage-point fee for fraud losses. All but three credit unions will be exempt because the law doesn’t apply to financial institutions with more than $10 billion in assets. Many credit unions fear that the exemption won’t be enforced and that they’ll lose substantial debit interchange revenue if retailers favor lower fee cards. The final rules don’t guarantee the exemption for small issuers, but the Fed included a statement that committed to periodically studying how the new law affects exempt issuers. So, credit union industry groups like the Credit Union National Association based in Washington D.C. joined banks in opposing Durbin. But while many large banks raised fees and eliminated free checking for the past year, most credit unions have not. About 81% of banks say they plan cut debit card rewards programs, 81% plan to raise checking account fees and 77% say they plan to raise fees for programs other than debit or credit cards, according to a 2011 American Bankers Association survey. Some credit union executives say they plan to keep their rewards programs, free checking and low fees to preserve and increase membership. Non-interest income, which includes interchange revenue, for all credit unions was 1.33% of average assets by the end of 2010, according to Callahan & Associates data. 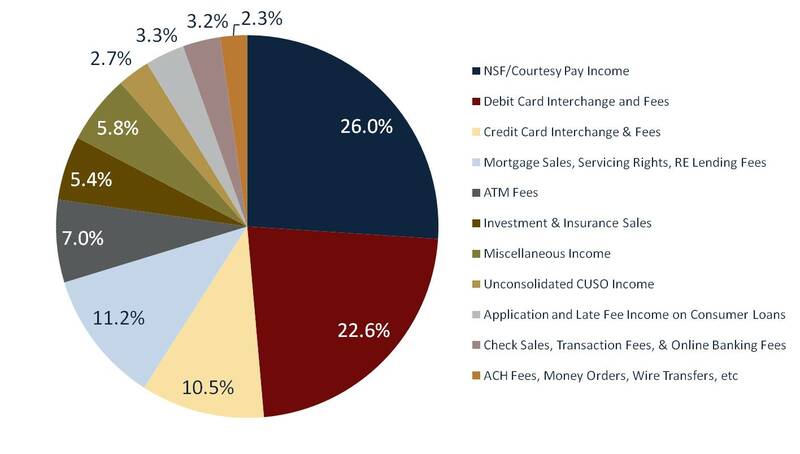 A Callahan 2010 study, which surveyed 130 credit unions, concluded that debit card interchange and fees comprised 22.6 percent of non-interest income for credit unions. Unitus Community Credit Union’s ($840M, Portland, OR) wants to keep its revenue intact but charging for checking and cutting back on rewards programs are last resorts recovering any debit interchange loss, says Paul Kirkbride, vice president of credit services. Unitus plans to ramp up marketing for its credit cards, which members can already use for cash withdrawals at ATMs, and remind consumers that they can earn more reward points by using their credit card. The credit union may add some charges for services like mailing paper copies, but it plans to keep its basic free checking service. And like many credit unions, Unitus will also try to trim operational costs, Kirkbride says. Credit unions will be well positioned to takeover market share from banks after the Durbin Amendment takes effect as consumers discover credit unions generally have higher return rates and lower fees, according to Chicago-bas​ed Zacks Equity Research. “The trend is expected to gradually transmit the profit origin of banks to the credit unions,” the research firm said in a press release. Credit unions will have an advantage over banks in offering rewards and free-checking services because the interchange law won’t immediately affect them, says Steve Winninger, CEO of Lake Trust Credit Union, ($1.6B, Lansing, MI). Credit unions can afford to take a more cautious approach toward replacing lost income because they’re driven by consumer interest and not the bottom line, he says. Other credit union executives say banks will have the advantage of more quickly adopting solutions because banks offer a wider variety of services, says Eric Acree, executive vice president of Vantage Credit Union, ($661M, Bridgeton, MO). Now that Durbin is finalized, credit unions will have to “get innovative” in cost-cutting and revenue enhancements, he says. Very good article. In addition to looking for ways to make CUs more efficient, there are enormous opportunities to generate incremental revenue & profits by refocusing marketing efforts and specifically, member acquisition initiatives on the right consumer demographics. CUs are now empowered to leverage OptiRate's ( http://www.OptiRate.com/banks ) capabilities to achieve growth and profitability.